Gammons Gulch is located north of Benson, Arizona, in the High Desert of Cochise County. Tucson International Airport and Tucson Arizona are 45 minutes from Gammons Gulch’s location. Kartchner Caverns is just minutes from I-10 exit on highway 80. 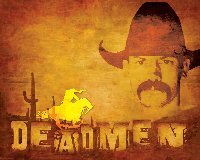 Tombstone, Sierra Vista, Wilcox are also within a short distance of Gammons Gulch. Much to see and do in Cochise County. Benson Arizona makes a great hub to stay at being within a 50 mile radius of the many Tourist attractions in Pima and Cochise County Arizona. We pride ourselves with being able to give one on one attention to our guests. We welcome small parties and groups. We also welcome Student filming and independent movies along with affordable daily rates. Looking For a Film Friendly Movie Set? Our Movie Set Location is perfect for your productions. We provide not only a Old West Town with a wide main street, but one with side streets and alley ways. Also as you cross the Dry Wash which has been used for many other scenes, you come to “The Gulch” which in it lies our Mining Camp. The mining camp has a mine, a miners Cabin ore cars, mining equipment and a huge one lunger engine that works. Another feature it has is a full beautiful view of the Mountains to the West of Gammons Gulch. Some of the stars that have appeared in productions at Gammons Gulch are: Jeff Fahey and Kristian Alfonso from the day time television soap show “Days of our Lives” who starred in the movie “Day of Redemption”, Sheree Wilson (Walker: Texas Ranger; Dallas), William Shockley (Dr. Quinn Medicine Woman; The Young Riders), and Peter Coyote (The 4400; Brothers & Sisters) who Starred in “The Gundown” have been at our Filming location. Music Video Productions such as Alyssa Milano’s “I Had a Dream” or Brian Lopez music video “Pray for Rain”. Also out of Phoenix Arizona a rock group called “Calabrieze”. Great Southern Wood Preserving Incorporated, Abbeville, Alabama have done numerous “YellaWood” commercials at our movie set location. Also Greere Doors from Tucson Arizona. Television Productions such as a reality based show from Belgium called “Wedding Bells In America” and “Wild Wild West” reality show from Denmark. Our Western Town in Arizona is featured in the History Channel’s Western Tech Series, where you can see our Old West Town and Telegraph office. Gammons Gulch is an ideal location for professional photo shoot workshops. Privacy and one on one dealings with the owners of Gammons Gulch allows direct attention to all your needs. Come visit our Old Western Town and Mining Camp which is a mix the 1880’s to our 1930’s side street. Gammons Gulch has a collection of Antiques and Old Cars. 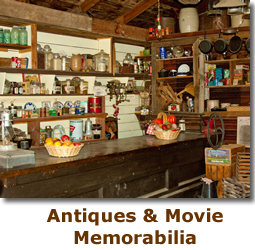 Movie Memorabilia such as Jays pictures and stories of the days his father and him worked security for the movie with such stars as John Wayne, Ava Gardner, Andy Griffith and many more. Our Old West Movie Set location offers self guided tours or personalized tours. While relaxing in our Western Town, enjoy our charming Birding area and picnic area. Bring a lunch, sit in the Saloon or picnic area and let your mind roam back to days of yester year. In times that life wasn’t going so fast and people took time to just enjoy themselves.